The Museum of Fine Arts plans to bring modern art into the public spotlight this year with #mfaNOW, a new program that focuses on the celebration of contemporary art and the artists who create it. The program features overnight parties, gallery talks and tours, artist demonstrations, music performances, and film screenings. All of these events are part of the MFA’s mission to engage visitors with art, culture, and community in new and unexpected ways. The event that has students especially excited is College Edition: mfaNOW Overnight, which will take place from October 14th to 15th. Admission will be free, but judging from the turnout at the last overnight event, expect a long line! Visitors will enter through the Linde Family Wing for Contemporary Art starting at 9 p.m., after the museum closes. Art featured at this event will include work by LA artist Frances Stark, a screening of Christian Marclay’s 24-hour video collage “The Clock,” and abstract prints by American painter Terry Winters. However, it’s not all pictures and paintings – MetaLAB (at) Harvard and MIT Hacking Arts will lead interactive installations throughout the night. At the last mfaNOW Overnight event on September 17th, MetaLAB presented Trust: The Presence of Secrets, an interactive installation related to themes found in Frances Stark’s exhibition UH-OH. Likewise, MIT Hacking Arts hosted a “play table” about the interaction of art and technology, featuring robots and a virtual reality headset. What MetaLAB and MIT Hacking Arts plan to showcase at “College Edition: mfaNOW Overnight” remains a surprise, but they are hoping to excite college students. Several additional features to “College Edition: mfaNOW Overnight” will make the event feel like a true all-night party. 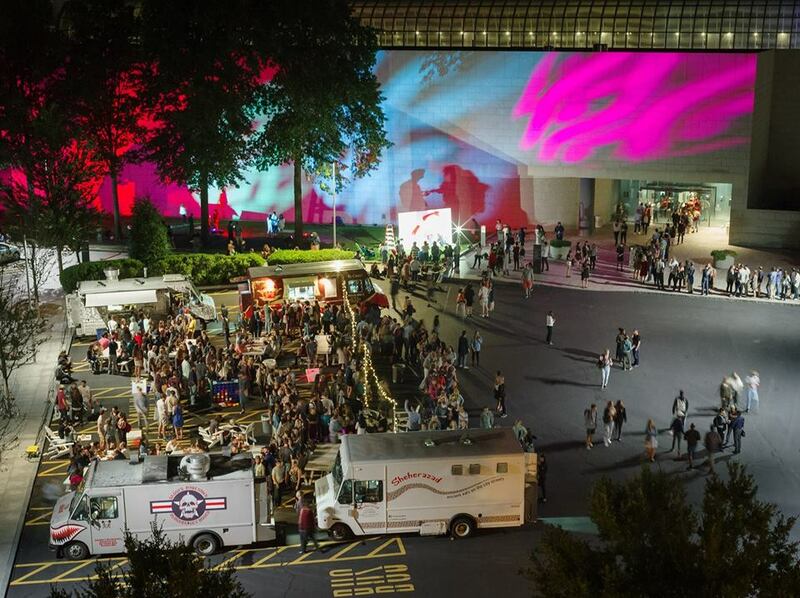 If students get hungry, they can chow down at food trucks like Daddy’s Bonetown Burgers, Jamaica Mi Hungry, The Parlor Ice Cream Co., and more out in the parking lot in front of the museum. For those looking to dance the night away, DJ Leah V and Berklee College Musicians will perform throughout the night. “I think my biggest reason is just because a lot of these events are very rare things that happen in a college student’s life,” said Anoush Calikyan (CAS ‘ 19). “I want to experience as many different cultures and events as possible while I’m here.” If you’re equally interested in what “College Edition: mfaNOW Overnight” has to offer, make sure to set aside some time this weekend for a visit. However, all-night parties aren’t the only events that #mfaNOW has planned for this season. Just as there is more than one type of contemporary art, there is also more than one way to celebrate it. Plenty of talks and lectures will occur throughout the season for participants who want to engage with contemporary art in more low-key ways. One particularly significant event was Oscar-nominated Disney Pixar animator Sanjay Patel’s lecture, which occurred in late September. Patel talked about “Sanjay’s Super Team,” a Pixar short animated film that he wrote and directed. The short tells the story of a young Indian boy who daydreams about Hindu deities as superheroes while he participates in a religious meditation with his father. It was inspired by Patel’s own childhood, a time in his life when he felt conflicted between the modern world around him and the Hindu traditions of his family. Patel also stressed the importance of accuracy when representing a specific group of people. He said he wanted to get it right. These events represent just two of many opportunities for MFA visitors to engage with contemporary art and culture in fun but also meaningful ways. A complete listing of #mfaNOW past, current, and upcoming events can be found on the program’s website. Feature photo courtesy of Museum of Fine Arts, Boston.